Be the first to share your favorite memory, photo or story of Lourn. This memorial page is dedicated for family, friends and future generations to celebrate the life of their loved one. 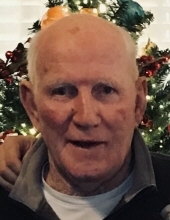 Lourn Frank Spillars, 77, passed away on Wednesday January 23, 2019 in Oklahoma City. Viewing and visitation will be held on Thursday, January 24 from 9:00am to 8:00pm with family greeting guests from 6-8pm. Funeral service will be held on Friday, January 25, 2019 at 3:00pm at Immanuel Baptist Church in Perkins. Interment will follow at Perkins Cemetery. Frank was born on July 23, 1941 in Vinco, Oklahoma to Lourn Hoy and Bessie Bell (Myers) Spillars. He grew up in Perkins and graduated from Perkins High School in 1959. He served in the National Guard for four years. Frank married Judith Ann Cundiff on October 21, 1965 at the First Baptist Church in Perkins. Frank was a family man; he loved everything he could do with his family. He was a great husband, dad and grandfather. He was an avid golfer and enjoyed fishing. Frank had a great sense of humor and had very unique sayings. He had a very unique way of connecting with people and many, many friends. Frank had a gruff exterior but a sweet spirit. Frank is preceded in death by his parents, sisters, Dean Fitzpatrick, Glenna Martin and Ann Spillars. Frank is survived by his wife Judy, his children Micheal Lourn Spillars and his wife Tracey, Jeffrey Wayne Spillars and his wife Michelle. His grandchildren Ryan, Hayden, Sam and Emma. He is also survived by his siblings, Dorothy Hurst, Kathleen Gardner, Roger Spillars, Kennard Spillars and many nieces and nephews. To send flowers or a remembrance gift to the family of Lourn Frank Spillars, please visit our Tribute Store. "Email Address" would like to share the life celebration of Lourn Frank Spillars. Click on the "link" to go to share a favorite memory or leave a condolence message for the family.